Socialist Party :: Is Labour anti-big business? Stefano Pessina the tax-exile billionaire boss of Boots has rounded on Labour's election tax plans as 'anti-growth and anti-business'. However, Tessa Warrington argues that, on the contrary, Labour remains subservient to big business interests, at our expense. Labour Party leader Ed Miliband responded to Pessina's criticism by saying he "ought to pay his taxes" rather than "lecture people" about voting. While this may be hard to swallow coming from a party whose own MPs were implicated in the Westminster expenses scandal, it has led to media and big business critics accusing Labour as being 'anti-business'. I can see why Labour would want to be. Considering the role of big business in causing the economic crisis and engineering austerity to protect their profits, a party that based itself on being against such greed and inequality would appeal to the vast struggling majority. But is Labour that party? Hardly, Mr Pessina and his media pals appear to have forgotten that it was the last Labour government that gave billions of pounds from the public purse to bailout the greedy banks and the rotten, failed capitalist profit system. 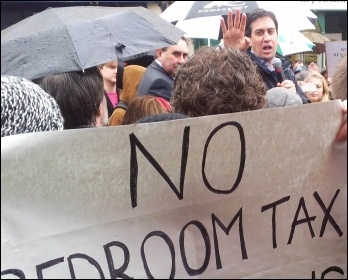 In their general election demands Miliband and Co have pledged to raise taxes on the rich in order to improve public services. But miniscule tax increases on the huge wealth of the elite won't solve the fundamental problems facing working class people. Labour has also refused to commit to the renationalisation of any of the privatised utilities, including Royal Mail, despite huge public support. This is not surprising as Labour is bankrolled to the tune of millions by big business, including the likes of Lord Sainsbury and John Mills of JML who dismissed Labour's plans to cap energy prices as "just rhetoric". Many Labour MPs and Lords are also connected with private companies, including private healthcare companies. Ultimately, the Labour party does not oppose austerity because it does not oppose the dictats of big business and the banks. Instead it has voted overwhelmingly for brutal spending cuts contained in the government's Charter for Budget Responsibility. Labour-controlled local councils have passed on savage cuts to working class people. The media moguls are only too keen though to scaremonger about the 'radical plans' of Red Ed. Their propaganda conceals the fear of the rich that public anger is building over austerity and inequality. Even small concessions could lead to a new confidence and increasing demand for compensation for the miseries suffered under austerity. 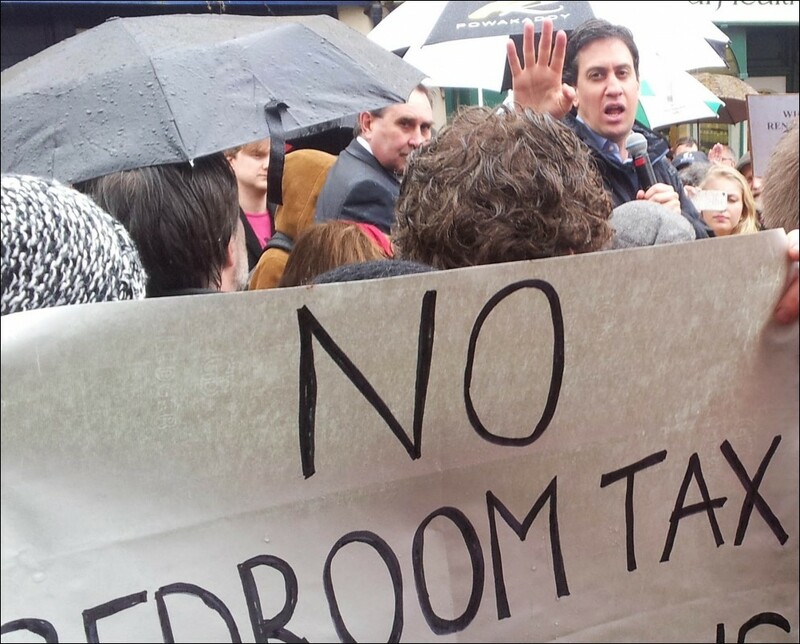 But Labour has ignored this potential mass movement and failed to mobilise it. As Labour is less and less seen as a viable alternative to the Tories, it poses the building of a new mass party of the working class and poor. This situation has already opened up in Greece with the election of anti-austerity party Syriza and with the surge in popularity for Podemos in Spain. The Trade Unionist and Socialist Coalition (TUSC), in which the Socialist Party plays a prominent role, is hoping to stand 1,000 council candidates and 100 parliamentary candidates in May's elections, a real alternative to the austerity status-quo. Opposing attacks on the working class and poor should be a principle, not a flimsy election promise. Labour convinces fewer people each day, people who are ready to be won to a socialist programme and fight for a genuine alternative to the dictatorship of big business. The dynamic government is getting tough with tax dodgers. It's put some adverts on the number seven bus route in Durrington, West Sussex, warning that the government is watching them. It may have escaped its attention but Stefano Pessina does not take the number seven bus - it certainly doesn't go to Monaco where this 'non-dom' worthy resides. Pessina attacked the mild attempts of Labour to tackle tax avoidance, as stopping tax dodgers will "ruin the country" apparently. I assume he refers to Monaco. The Daily Mail has the cheek to quote him as a 'businessman' when his only enterprise seems to be monkey-business with the tax system!